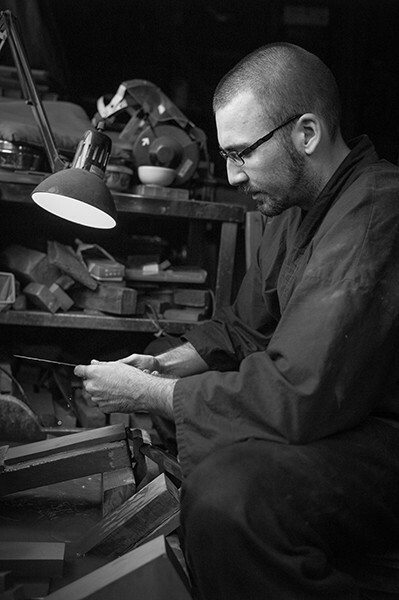 Yet, in Sakai, Osaka, in Southern Japan, a region long associated with smithery and knife-making, Westerner Eric Chevallier has embarked on an apprenticeship with Yasuhiro Hirakawa in his Sasuke knife and scissor workshop. Not only has Eric entered a culture some would describe as a world away from his native France by simply living and working in Japan, learning the language and embracing the lifestyle, but also he has entered into an ancient culture, steeped in custom and subtlety as his Master is a 22nd generation blacksmith, whose ancestors specialised in gunsmithing between the 16th and 19th Centuries, after which the workshop turned to bladesmithing in 1867. 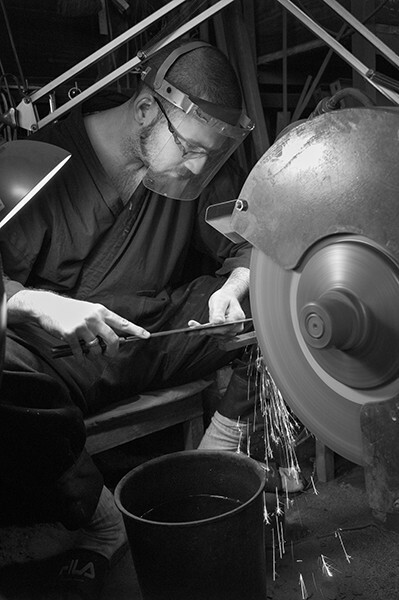 Here, we are extremely privileged to gain an understanding of Eric’s total immersion into this little-known world of Japanese Master and apprentice, where Eric’s passion for the craft has seen him assume the role of the apprentice bladesmith – patiently watching, learning, or ‘stealing’ the craft in order to perfect, protect and perpetuate it. 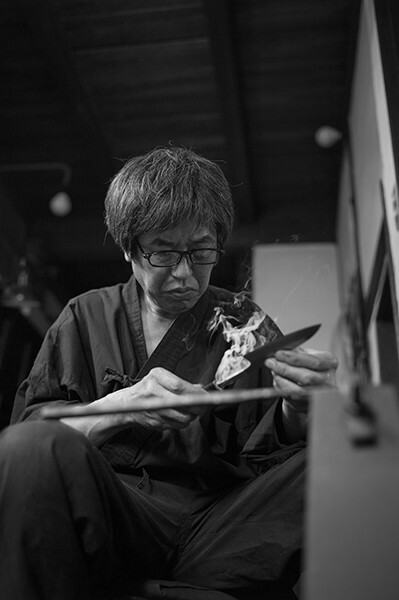 Firstly, for readers that aren’t aware of Sasuke Blacksmith Works, please could you briefly describe the company and what it is that you make at your forge? My name is Eric Chevallier; I am a blacksmith apprentice at the old forge: Sasuke. 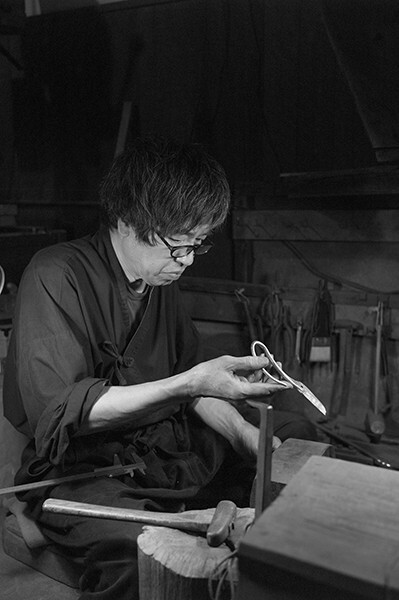 My master is Yasuhiro Hirakawa, 22nd generation of blacksmith and 5th generation of scissors and knifesmith. 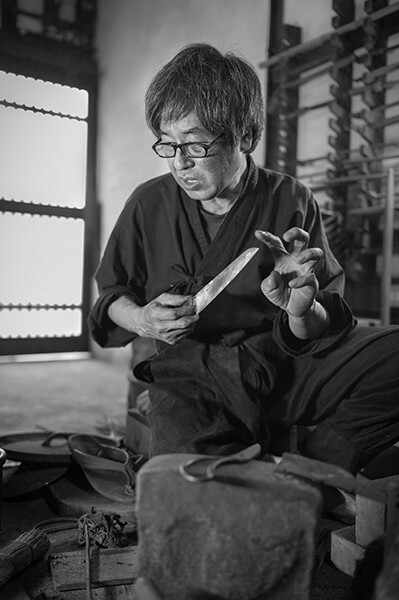 The Sasuke Blacksmith Works is a kitchen knife and gardening scissors factory, founded in 1867 by the blacksmith master Sadajiro, first generation of Sasuke and last generation of Sumiyoshiya gunsmiths. Sumiyoshiya gunsmiths was a big firearms factory originating in the 16th century. 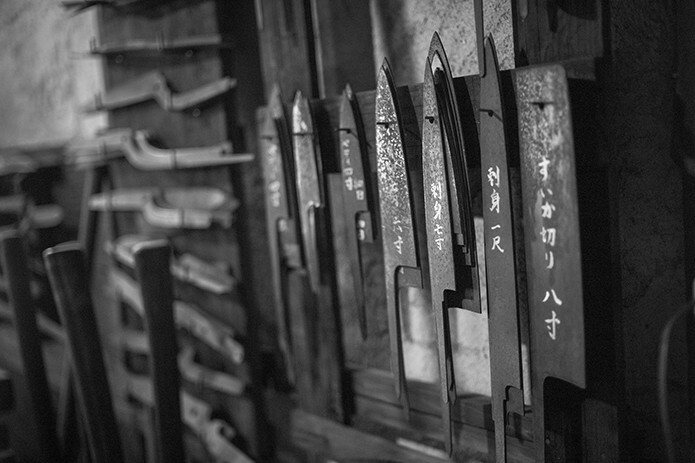 Sakai is a city with a long history of knife-making. 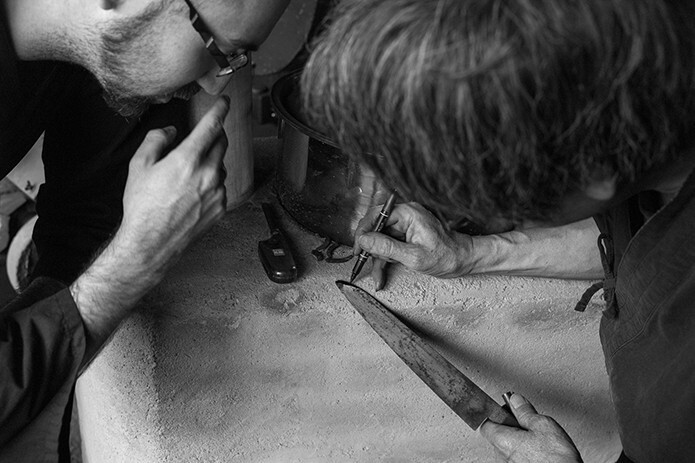 Can you explain the historical connection and what it is about Sakai knives that makes them so unique? Sakai craft history began around the 4th Century when emperors and important people started to build giant funeral tumuli (kofun) in the region. Many craftsmen came to Sakai to forge tools and pottery to help in their construction, and it is thought this was the start of smithery in Sakai. During the 16th century, firearms and tobacco were brought to Japan from Portugal and the Netherlands, and the manufacture of guns and tobacco knives to chop the tobacco leaves – the first of which were made in Sakai – made Sakai the most famous cutlery and forging city in the world until now. 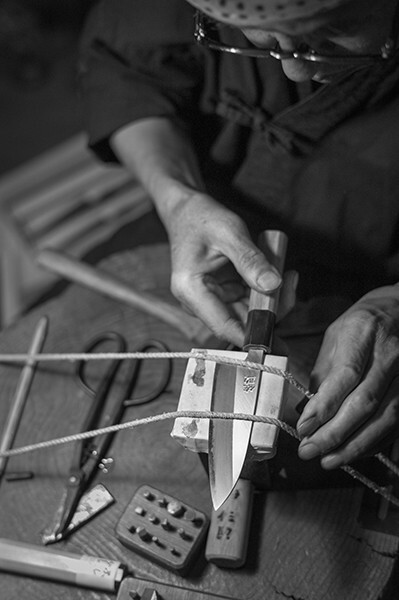 Sakai knives were, and still are, renowned for their unique sharpness. You’re from France originally and moved to Japan in your mid-20s. What was the catalyst for making the move and the appeal in becoming an apprentice blacksmith? I moved to Japan originally to learn the Japanese language at a higher level. 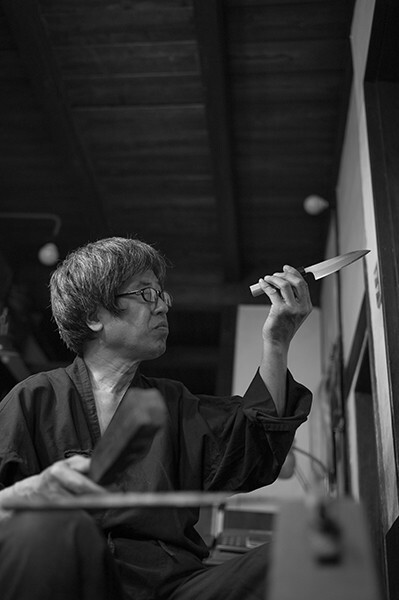 At the time, I had the chance to meet the master Hirakawa who required a French translator for an exhibition in France. I initially began as a translator and assistant before becoming an apprentice. I decided to learn this old art to give the best explanations to our customers and to protect this culture from modernity. Nobody wanted to continue this work, so I decided to work everyday to make it live longer day-after-day. How important is learning the Japanese language and embracing local customs as part of an apprenticeship? 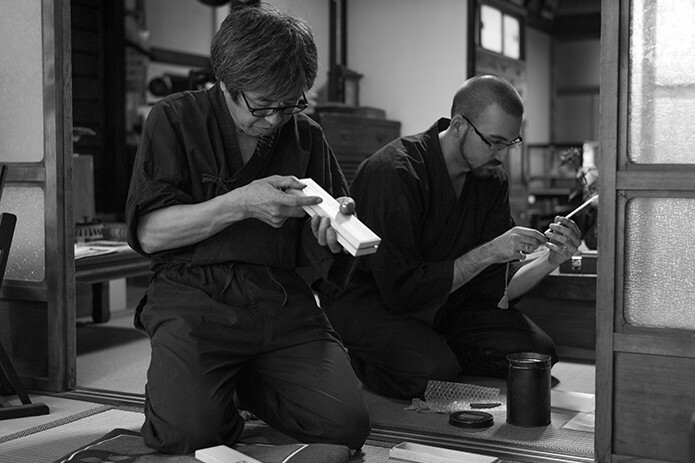 An apprenticeship in Japan is like building a new family with the Master. So, learning the Japanese language is important to communicate everyday and make a confident link between us. As a future blacksmith, I also need to talk with other craftsmen like handle makers, sheath makers, and with other blacksmith too, and I can only do this speaking in Japanese. I can’t imagine my life just speaking in French or English, because I think it’s not just a question of comfort but rather a question of respect. 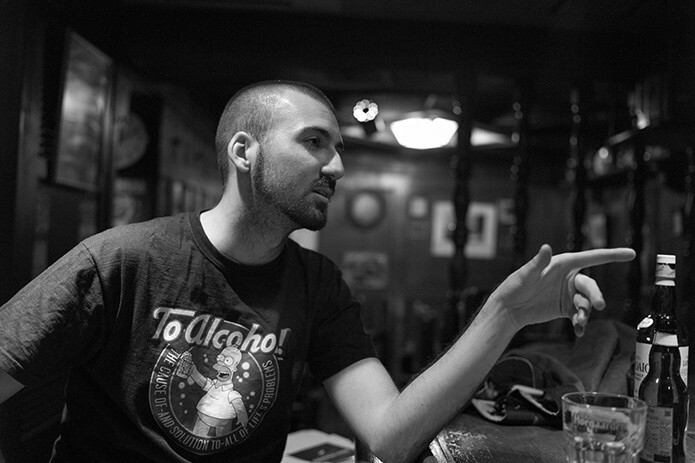 Could I live in the USA if I just spoke French – is that reasonable? Of course not. I don’t understand non-Japanese speaking foreigners who have lived here for a long time without bothering to learn the language – it makes Japanese people uncomfortable in their own country. 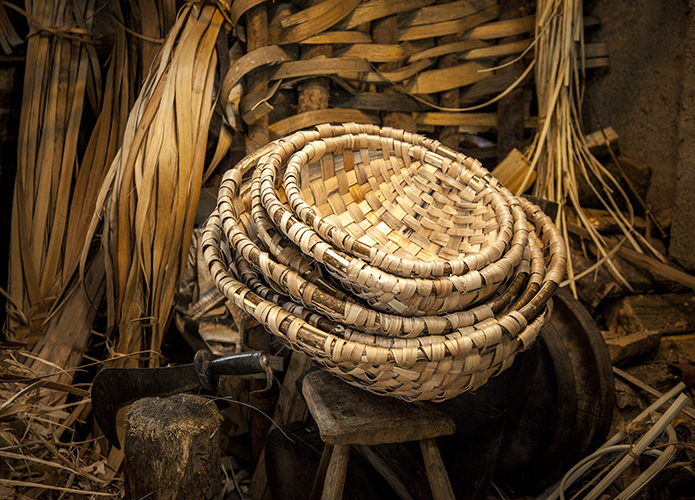 Very few Europeans have attempted to become apprentices in traditional crafts in Japan, and of those that have tried, only a handful have lasted more than a few months. There’s clearly a linguistic barrier, but do you think there are other reasons, such as customs and cultural differences, perhaps? Of course the linguistic barrier makes it difficult for someone to stay here, but maybe the patience required too. I think it’s clearly impossible to learn a traditional craft quickly in Japan. It’s a gradual step, and apprentices can’t feel any evolution in just a few months. It’s necessary to stay many years and show our motivation to the Master until he decides to teach something. 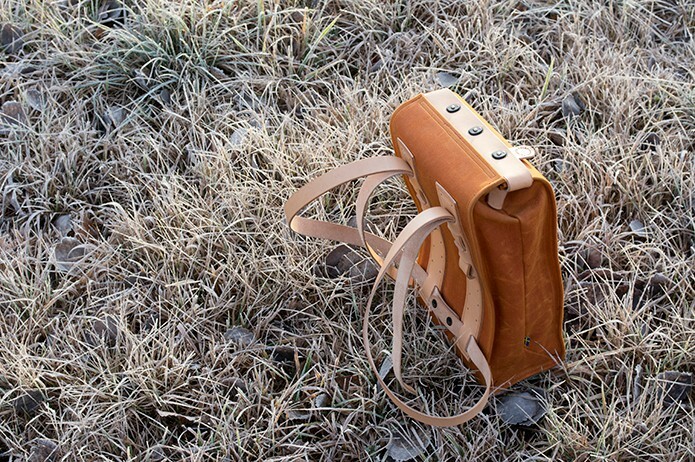 The Japanese use a term called “gaman”, which doesn’t really have a Western equivalent meaning, which is an important quality in achieving success in traditional Japanese crafts. It literally means “patience”, and it’s the most important quality to live in Japan. 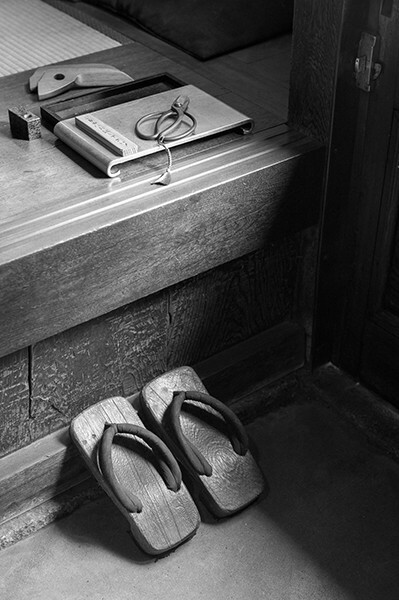 We need time to assimilate Japanese cultures, customs and language subtleties. I had never imagined that I will do what I am doing here. In fact I wasn’t even looking to become an apprentice blacksmith. 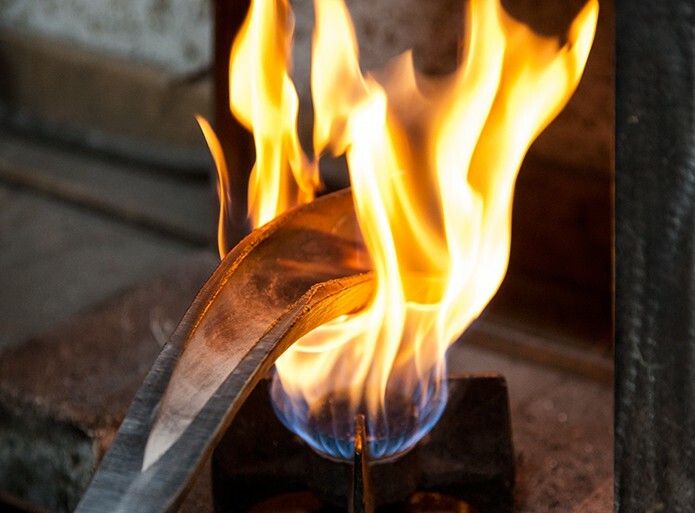 I think the reason why I can continue is that I had no idea about this world; I was a total beginner and I learn everyday about Japanese culture and forging. Maybe the best way is not to plan anything, but to try and see without waiting for something. What criteria does a Master consider when selecting an apprentice – for instance, is it more about demonstrable talent and prior experience or the personal qualities of the individual that are most important? I think the most important qualities a Master looks for are patience and the motivation to learn. My Master chose me because I was a total beginner and had never forged before. It’s important to show we are able to work hard, forgot rest time, and forego holidays, money and private life. If I was able to forge, I don’t think he would have chosen me, because it’s harder to break habits. I understand an apprenticeship with a Master in a traditional Japanese craft is very different to apprenticeships available in Europe. Can you explain what a classical apprenticeship involves on a day-to-day basis and what is required of you as the apprentice? During this time I have to ‘steal’ his knowledge. 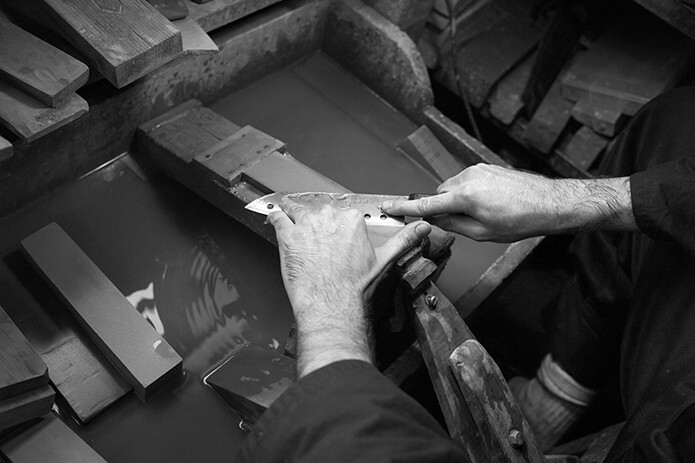 I see him forging, sharpening… and I have to memorise all of steps I can see. Here the Master doesn’t teach. He works late into the night and I have to stay if I want to learn something. Without this usual teaching link between the Master and the apprentice, it is really difficult to progress. So, I try to forge when he is absent or during my off days because he doesn’t let me forge during work days. 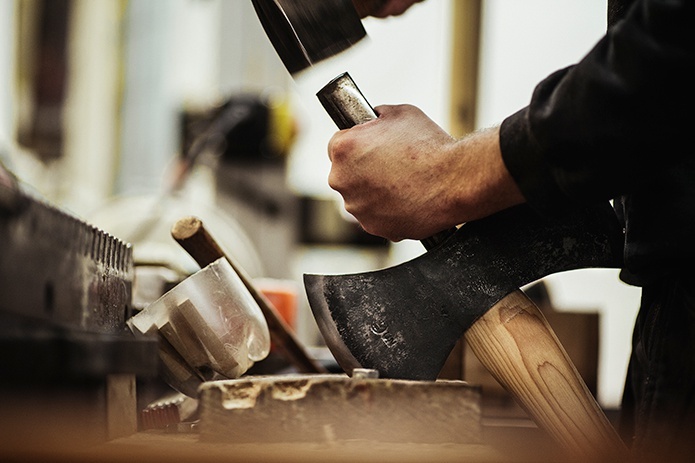 As an alternative route to an apprenticeship, are there academic institutions where the skills to forge blades can be learned, or are the skills always learned directly from an apprenticeship with a Master? I think forging is natural work for a human; we have it in our DNA because our ancestors did this work in the past. If somebody takes iron, warms it, and beats it with a hammer, they will progress, slowly, with a lot of mistakes, but they will do. European people talk about iron categories, carbon percentage in the steel… but in fact in Japan nobody takes any notice of this – it’s too academic! In Japan there are no academic apprenticeships, it’s just see, steal and memorise. I’m intrigued about the relationship between the Master and the apprentice, which I understand isn’t like a teacher & student or superior & subordinate-type relationship. Likewise it isn’t a partnership either. Can you describe the relationship between the two and how an apprentice is expected to learn? The student is like a rival for his Master. So, there is no consideration from him to the apprentice. 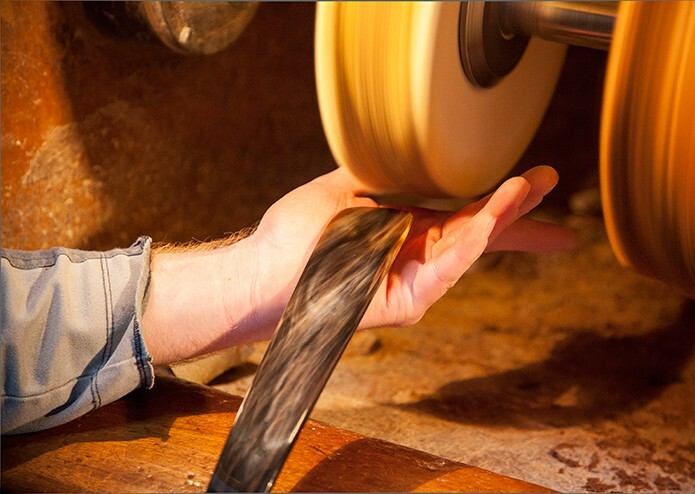 Sometimes my Master is like a father – he explains to me many things about the materials he uses and blade history, whereas sometimes he is the devil – he explains to me the mistakes I’m making and stops my progression. 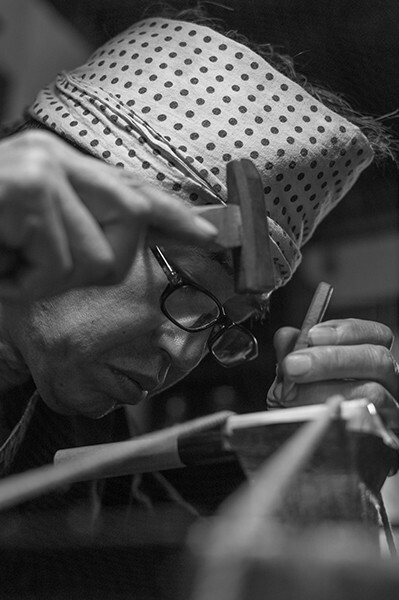 I don’t know if my life with Hirakawa is the same for every apprentice in Japan, but if it is, I understand why the number of Japanese craftsmen decreases! An apprentice can’t expect to learn easily in this kind of traditional and old apprenticeship; he just has to wait for a good time when the Master will decide to teach something. For anyone considering becoming an apprentice in a traditional Japanese craft, are you able to provide any tips or advice? Even though it’s hard, continue, even if you want to beat your Master, control yourself! As an apprentice we are nothing and many years are necessary to grow and become somebody. Usually, 10 years are necessary. 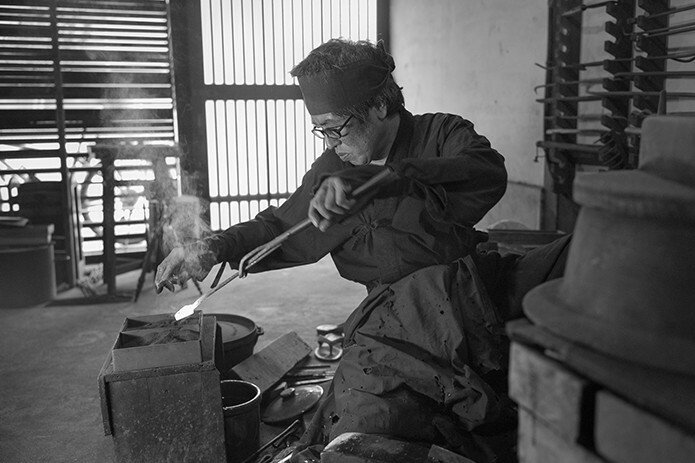 Aside from your work as a blacksmith, you’ve also been featured in television documentaries in Japan. Can you explain what this involves and how the media opportunity came about? Japanese people are fascinated by foreigners’ points of view; they listen to us and progress because of this. Where we, Westerners, believe we are the master of our universe, Japanese people continue to progress because they are never satisfied and try to achieve perfection every time; even if we think it’s perfect. Japanese people simply think differently. It’s the reason why I often have the opportunity to talk about this on the TV and make documentaries with Japanese media companies. It’s very strange – some days I have fans coming to take pictures of me, and as a TV star I am happy and proud, but after that I clean my Master’s WC… Japan really is a land of contrasts!! Finally, what will you do when you have completed your training – can you envisage remaining in Japan and establishing your own forge there and becoming a Master yourself, or will you return to France with your new skills? I don’t know yet. I need time to learn because I am still a beginner. 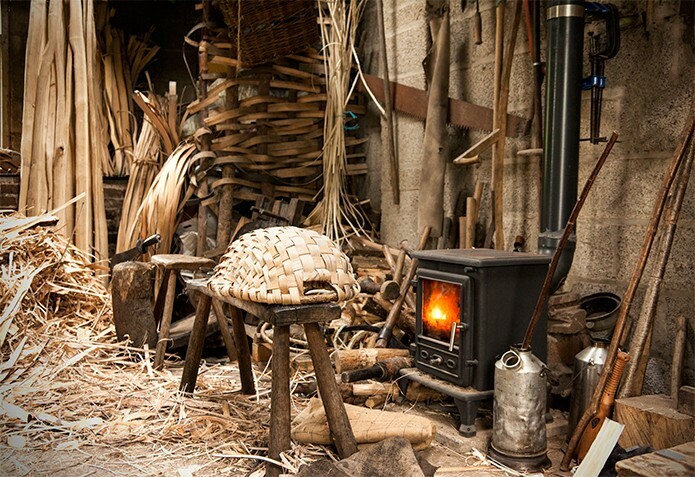 Maybe I will go to France to learn some forging techniques – French blacksmiths are incredible too, it’s important not to forget, and remember European forges were amongst the best during the Celt and Viking periods. 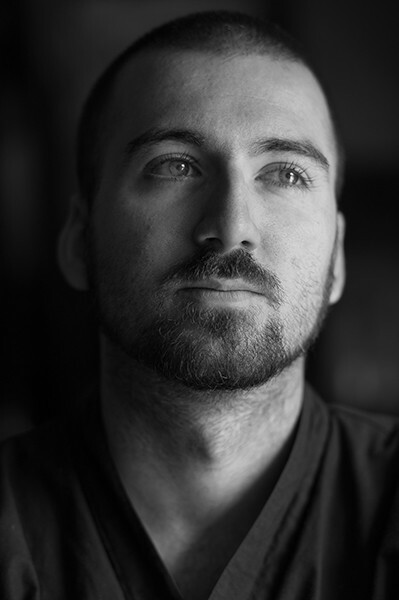 Thanks to Eric Chevallier for taking time out of his busy schedule to answer our questions and to Adam Marelli for his permission to include the collection of images.